Last week we read a book about Maia making poi for her kapa haka group. Today we started creating our Poi as a follow up activity and for our end of year performance. Here are some photos from today showing our first steps to making poi. Tomorrow we will be learning how to do a four braid plait. Congratulations to Tamzyn who received the Principal's Award for Week 7. She has been persevering with her reading. Also congratulations to Alex, Tyrone, Madison, Shakshi and Dalia. Congratulations to Dante who received the Principal's Award for Week 6. She has been persevering with her writing. Congratulations to our PRIDE Certificate recepients. They were Christian, Mazzlin, Sienna-Nicole, Troy and Connor. They have been working diligently with our art for our end of year production. It is getting close to the end of the year which means we are getting ready for our school production. 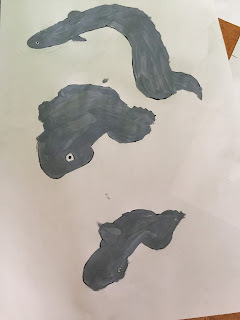 This week we have started some artwork to prepare for our song. Here is a sneak peak of some of the work. Thank you to Dallas who took photos of all the art. Congratulations to Connor who received the Principal's Award for Week 5. He has been persevering with his writing. Also congratulations to Sienna, Levi, Sequoia, Troy and Dalia for receiving the PRIDE Certificates. This week for writing we have been looking at using different sentence lengths to add interest to our writing. We have been learning to write complex sentences. Here are some of our sentences. Two youngsters keen on video games have proved their skills can be educational. 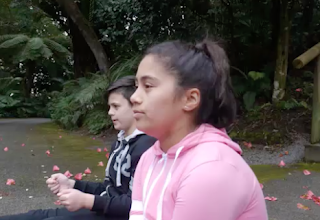 Auroa School's Kaiah Bloor,12, and her brother Durann,11, won the supreme award in the second annual Moa Awards in Opunake on Tuesday night. The two teamed up to make winning movie The Bum Race, an imaginary journey around Taranaki. Kaia and Christian Moeahu from Opunake. "They sat on their bums all around Taranaki. Each photo was a still and they used stop-go animation," principal Heath Chittenden said. "In between, they've got video gaming noises, magic boxes appear they can punch to get more points and they get to fly on broomsticks." Chittenden was thrilled with the win, as well as the swag of other awards the school's students achieved. "The calibre across the whole cluster is extremely high. We have some pretty talented students and teachers here," he said. This year was the second time the technology awards for students of Matapu, Opunake, Auroa and Kaponga Schools (known as the MOA Kluster) have been held. Parents were begging for tickets to the sold-out awards night, Opunake Primary School's Hannah Williams said. The theme for the night was Star Wars and the school principals all dressed as characters from the movies. Awards were presented in 10 different categories, including Te Reo, blogs and graphic design, animation, short movies and educational video. Finalists were driven to the awards in classic cars and entered via a red carpet, Williams said. The awards were started to help the four schools incorporate digital literacy and new technology into their curriculum, Opunake Primary deputy principal Leo Frank said. "The nice thing is that all our traditional subjects are in there, behind everything there is learning going on that reflects the curriculum, its just a really good, interesting way for the kids to learn what they need to learn." "The kids who have an artistic bent have a real chance to scratch that itch, its really nice to give them that opportunity." Last night we all enjoyed our MOA Awards. We were a very lucky class who had 9 nominations in many different categories. We got to see lots of our work up on the big screen and show our whanau all of the great work we have completed over the year. Unfortunately we were not successful in all categories but we are very happy to those students who did win. Congratulations to Luke who received the Principal's Award for Week 4. He has been persevering to make great progress in his maths. Congratulations to Sofia, Dallas, Madison, Levi and Tyrone for receiving the PRIDE Certificates for demonstrating PRIDE in different areas of their work. The school received their safety vests to wear while waiting for the buses today. Here are some of the students wearing their vests. Our MOA Awards made it into the Hawera Star. 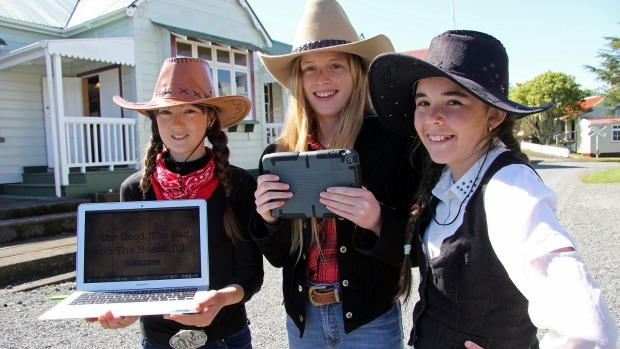 Opunake Primary School students, from left, Jaimee, 13, Lucy, 13, and Brydee, 12, are hoping their film "The Good, The Bad and the Beautiful" is good enough to win the best short movie category at the annual MOA awards. The girls filmed their movie at Stratford's Pioneer Village. Students at four rural Taranaki schools are hoping they've caught the elusive Moa in the lead up to this year's annual awards. Taranaki's premier technology awards for students of Matapu, Opunake, Auroa and Kaponga schools, known as the MOA Kluster, are being held on Tuesday November 10 at Opunake's Sandfords Events Centre. Tickets have sold out to the second annual 'Moa Awards' event and Opunake School principal Lorraine Williamson said the judges would have a hard time deciding who would win each category as well as the overall supreme prize. "I think the calibre of movies is superb, I have looked at all of the movies and I think it will go to the wire," she said. "I think it will be a very close call for whoever judges it. I just think that the kids have really lifted the bar. I'm just so impressed by what all of the schools have done." Auroa School principal Heath Chittenden said at least two items entered by his school had a good chance of taking out the top spot. The winner at 2014's inaugural event was Opunake School but Chittenden hoped this year could be his year. "We've got about 39 finalists that are here so we've got a good variety of different areas that they've been put into," he said. "I definitely think there's been a big jump in the standards from last year to this year. Kids seem to be a lot better organised, a lot better planned out, some of the ideas are phenomenal." 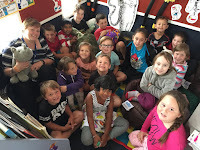 Kaponga School, newer to the cluster, has entered the awards for the first time in 2015. Principal Shane Downs said the winning entry would depend a lot on each individual judge's tastes. "We've got some pretty cool still stuff but it depends if they are looking for the more technology intense stuff," he said. "No one really knows as to what they are going to do. Last year the one that won it was a silent film." Students have worked all year to prepare entry projects alongside their classroom learning. Matapu School principal Jarad Chittenden was unavailable to comment prior to deadline but is understood to be looking forward to the event. Created in 2014, the annual event, held at Sandfords Event Centre, is open to students from 5 years old to 13 years old. Students can win awards for best student blog, best short movies, best educational movies, best music video, best animation, best Te Ao Maori, best graphic design, best original image, best book trailer and best actor/actress/narrator/performer. Categories are divided into junior, intermediate and senior levels. Junior level is for students year 0-3, intermediate is for year levels 4-6 and senior is for those in year 7 and 8. Educators are also in the spotlight with two awards, best teach blogs and best use of IT by a teacher, up for grabs. Independent New Zealand and overseas judges are reviewing the work in each category and allocating the awards. Held on Tuesday November 10 2015, starting at 7pm, the event has completely sold out. Congratulations to Alex who received the Principal's Award for the week. He has been persevering with his maths assessment to show what he has learnt throughout the year. Also congratulations to Luke, Connor, Christian, Troy and Sienna-Nicole for their diligence in their maths work throughout the week.